You will need a drain for the backwashing cycles. This should be no longer than 20 feet from the softener. You will need to purchase a flexible 1/2” I.D. vinyl or polyethylene line. This backwashing drain line will be under pressure when backwash cycle is on. Make sure drain line is secured. The drain line will need to run into a drain, which should be a min. 1 1/2“ size, and ideally be below the top of the head of your softener. Local codes should be adhered to. 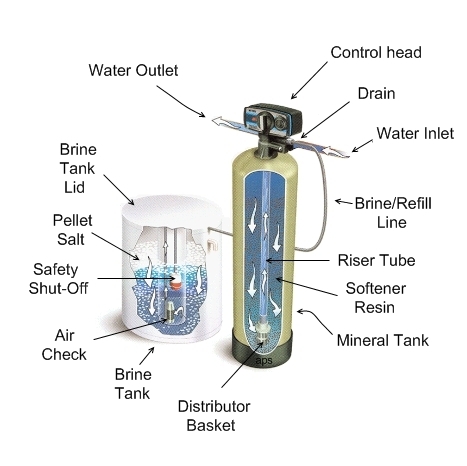 The distributor tube should be in the mineral tank with screen intake at the bottom, open end at top. The open end should be trimmed to be flush with the top of mineral tank. The screen intake should be resting centered on the bottom.